Virtual PBX – Great for small businesses and marketing campaigns. 01:04 Should your eBook stay behind a reg page? 06:43 John Blue writes in and wants a thumbs up / thumbs down segment on LinkedIn web/banner ads, Google ads, Yahoo / Bing ads, Facebook ads. Check out Paul Gillin’s book. 18:10 Marketing Over Coffee Book Giveaway – Linchpin, The Dip, Mastering the VC Game. 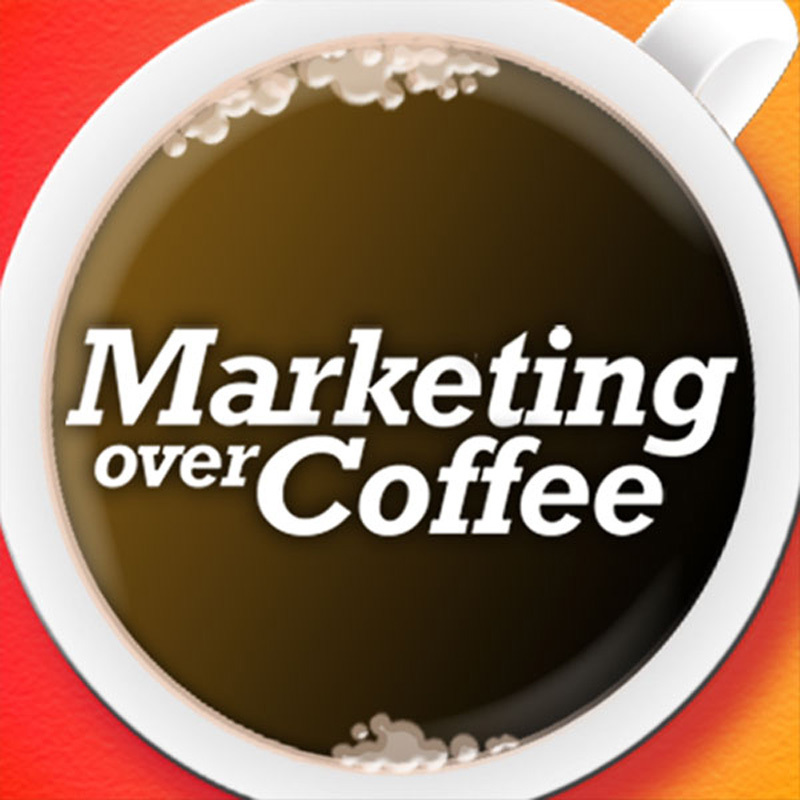 Why haven’t you bought the Marketing Over Coffee App yet? 22:18 Question of the Week – Where are you advertising and is it working for you? 22:34 Thanks to SnuggMugg for the Coffee Snuggs – we’re giving away two to listeners! 23:10 Upcoming Events – Inbound Marketing Summit Passes raffled to newsletter subscribers. Online Marketing Summit Events Boston July 7, NYC July 9, BlogWorld and New Media Expo Discounted Rates , Big Man XV! I’m only advertising via my blog. And I’m not really advertising per se, more so just trying to build my personal brand. I believe it’s working because I’ll soon be starting a new and exciting position in my career. On that note – hello segue – Mr. Penn, the new job will entail working with college applicants. Now that you’re out of the student loan business, what are your top three knock-out insights into the college entry demographic? AdWords is still the 800 lb gorilla and I like that they get it from a small biz perspective. You can bid whatever you want and they give you API access. Use Yahoo/AdCenter, but not a lot of traffic. Also, you have to spend something like $5k/mo w/ them for them to give you API access which is a joke. Still most of our traffic and sales are driven via organic search and word of mouth. I’ve started using Facebook Ads in December. B/C of our location in NYC we were able to get quite a few impressions and our fan following grew rather fast. However, the conversion rate to client has been in the single digits. Because we are a bricks & Mortar Biz, advertising on Yelp and Google Local (now called google places) has been much better. And FREE! Yelp ads are pretty expensive, so we just stick with the free offer and work our clients for honest reviews every once in a while. The facebook ads is something we will continue to play with, and with the right picture and just the right message, I’m sure we will get the conversion up! That’ll be all for now! Also, can’t wait to hear more about the upcoming contest! Anyhow – thank you both for your work! I’d love to support however I can. The Blue Sky team is amazing too although I’m not a customer yet. Would love to stay posted on how WP 3.0 is helping. I’ve had the chance to run into the beta version before it became final and it seemed great only if you intended on moving the entire site over to the brand new theme (to me – it seems great for brand new users, for current users – it’s more of a hassle unless there is a redesign in plan). Gotta say that I’m seeing the opposite of what you guys talked about. We’re doing PPC (in the six figures monthly), banners & sponsored email and seeing results from all – contrary to the “stupid people click search ads” concept, they are working excellently for us in finding very technical B2B buyers who want to talk about specific solution requirements. My take is that good PPC ads work well when people are getting into buying mode, rather than research – if you see a good ad, esp. from a company you’re familiar with, that’s going to take you straight to specs/pricing that you want at that stage. If conversion requires multiple visits (we est. 5-7 visits in our sales process) you have to very careful not to optimize on the last visit where people convert – if you lose them in the consideration stage, you’re out of the game. Which is a lot harder but absolutely critical for complex sales. So banners don’t produce many conversions for us, but they do bring visitors who look at a lot of key consideration pages on our site. Unfortunately we are in a highly competitive space and the traditional advertising routes are not worth the return yet. Still testing though. What works best for us is producing helpful resources (Mini apps, sites, guides, ebooks, fun stuff etc) that are of interest to our target market and very sharable across blogs and social and very seo friendly. We then advertise heavily on those resources. Pay someone zero up to a couple of hundred bucks to produce the resource then seed it across the web. Our rule is low cost and zero maintenance. Even better is something visitors themselves can contribute content to.